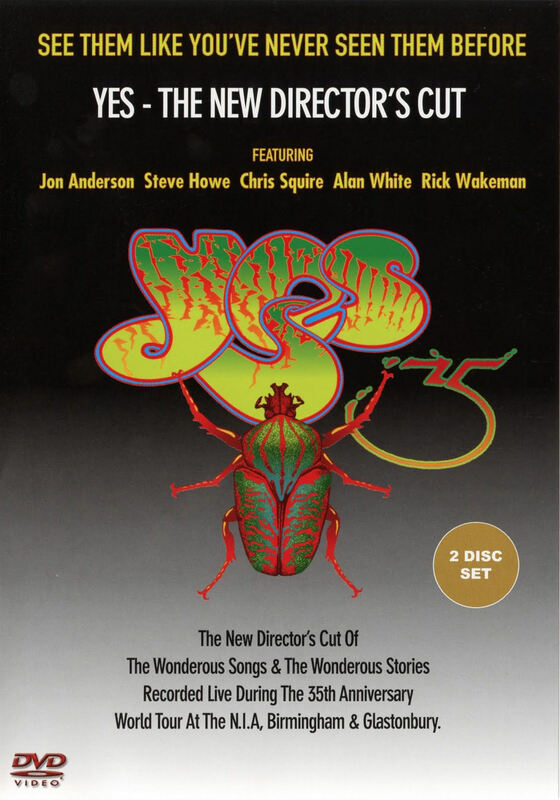 The entire performance by Yes at Glastonbury is now available on 'Yes 35: The Director's Cut' 2 DVD set. This footage blew me away -- Yes live and kicking to a huge crowd! While the camera work is compromised, due to the venue and there is no light show, the sound and performance are brilliant. Yes rocking to the max! "Siberian Khatru" - GREAT version in the blazing sun, with Steve wearing shades and ripping it up. "Magnification" - Cool rendition, although much of the crowd clearly unfamiliar with this. "Don't Kill the Whale" - Up until now, only the first few rows are really getting into it. This wakes the rest of the crowd up and Chris gets 'em rocking. "We Have Heaven" / "South Side of the Sky" - Camera work not ideal, but a ripper version!! Most of the crowd are converted Yes fans now. "And You and I" - Superb!!!! "Heart of the Sunrise" - This really goes down a storm. Yes showing everybody how it's done by the big guys! "Awaken" - The audience seem like they might get restless at the beginning but then get transfixed. Amazing! "I've Seen All Good People" / "Roundabout" - Keeping the momentum up and the crowd are going bananas. No wonder 'The Ultimate Yes' 2CD charted so well in UK after this performance. It is SO GOOD to see our fave band giving it all they've got to a deservedly large festival audience. Going by the press, you would never have known that Yes even played at Glastonbury, but this DVD is an excellent record of another historic event in the 40 years of Yes. 30-06-2003. Monday 4:00pm. Just got back from Glastonbury Festival. Saw some great performances from the likes of R.E.M. and Radiohead over the passed four days but for me the highlighht of the festival had to be the appearence of Yes on the One World Stage at 4:15 on a glorious Sunday afternoon. Considering all 120,000 tickets for the festival sold out in a record 24 hours and weeks before any line up was announced Yes drew a massive crowd out of a non-Yes audience, in fact it was one of the most appreciative and warm crowds I've seen Yes play to in the last 25 years! the atmosphere was electric, which is pretty hard to achieve on such a hot day with the sun beating down on a crowd who've been hanging on for an hour in the blazing sun (Yes were due on at 3:30 but the previous band, Slovo, had some technical problems and played over their alloted time)the roar of the crowd was fantastic as firebird Suite played over the P.A. Yes cut out all the solo pieces from the set due to time restrictions and it sounded better for it, a direct, concise set of very strong songs played pretty much to perfection. Even though I was quite near the front, it sounded very meaty but clear (apart from the closing section of Awaken when Yes were pumping it right up did the sound get a bit mashed). I feel it was a real gamble for yes to play at the festival as I said earlier these people had all ready bought their tickets for the festival before they knew Yes were playing, they could have played to a totally indifferent audience (if an audience at all!) but whoever advised them to do it deserves a recognition for a great triumph for Yes. I for one can't remeber enjoying them more than at that great festival! 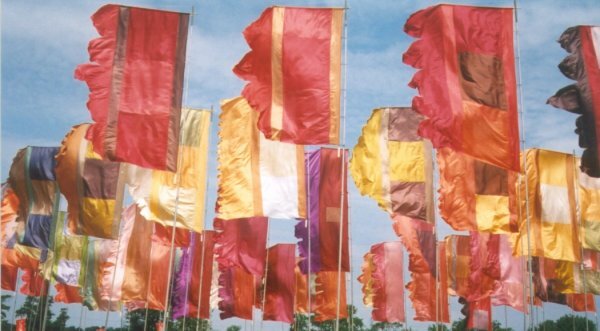 Blazing sunshine and muggy air are not conducive for a good prog experience, particularly when the masters of arthouse pomposity are performing their overblown bombastic elaborations at their first ever Glastonbury appearance. Yes, despite the concerned cries of �Are you sure' that will no doubt follow, have never been here before and that makes another one you can add to your list of Glasto trivia to annoy people with. The originators of the two-word review (�Yes? Maybe.�, not �Sh*t Sandwich�) are back in as much of their original line up as is comfortable. Anderson returns, a little plumper than of old, but still with that annoying voice like the whistle of a boiling kettle that can only really be tolerated rather than enjoyed, like a vocal version of pilates. He�s wearing what appears to be purple pyjamas and a lime green t-shirt; only an old hippy can wear something like that and make it work. Returning also is Rick Wakeman, who hasn�t changed one iota in the last 30-odd years and still has the worst dress sense in existence. Steve Howe is as laconic and cool as he ever was, like some hippy uncle that always turns up at weddings pissed and plays guitar in the corner of the bar just to annoy people. Mr White returns on drums and blimey, look at the size of Chris Squire! Did he have one too many pies or what? Still, it�s the music that matters and it�s pretty damn fine regardless of how ridiculous they look. Yes, though, are unique in the prog world. There�s nobody actually doing stuff like Yes other than Yes, and that�s only because nobody else can be bothered. It�s enough having Yes in the world without having someone else trying to copy what can�t be copied for fear of ridicule. Like them or not, they�re the absolute masters of over-statement, so exquisitely precise and angular yet flowing so smoothly. 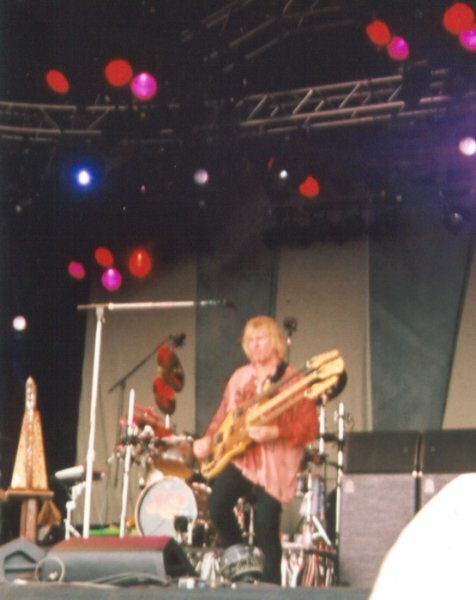 Wakeman especially is upfront about grabbing the real attention from the others, looking down from his throne like he�s at Castle Rick, playing ambidextrously as always and wearing groovy robes because, well, he can. �Magnification� is out of tune so they start again, but it�s just a dropped stitch to Yes who lovingly caress and massage the tension out of their tunes. They�re like a glorious slow session of er, �relaxing in a gentleman�s way� because if you fancy passion, sincerity love and lust, then Yes scratch the itch; but if what you really feel like is a fastidious solo on the old one-string bass, you really cannot beat them. You have to be in a special mood for Yes, because they�re the sort of band that you have records of but rarely play because, as beautiful as the music is, they�re an acquired taste and it doesn�t go with company. Still, thousands of bubbles are floating stagewards, so let�s just relax. People care. To many, Yes create the finest music in the world and they mean it most sincerely. They may be mildly irritating, but they truly are magnificent at what they do. Majestic, pompous, pretentious and overreaching at all times, they�re a musician�s band that know intimately the deep spiritual magic that can be generated by people who just connect musically. That�s the reason they seem to take so long to actually get anywhere; they�re enjoying what they do so much - why not wring every last variation out of it? It�s a trip down Memory Lane for Yes, but they play it safe. They wouldn�t dare leave out �Roundabout� and on the whole they don�t disappoint. Although completely at the wrong time of day, there�s little to fault with Yes as they are. 34 years have given them a touch of class that snobbery dictates they shouldn�t have, but which reality gives them gratefully. 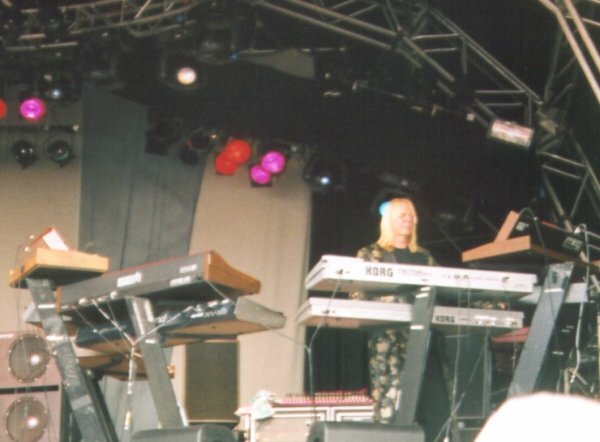 Got an email today (Mon 2nd June 2003) a friend got to speak to Rick Wakeman after his last solo gig on Saturday and he said Yes will be on stage at 3.30p.m. on the One World stage and willl play for two hours! Wow! 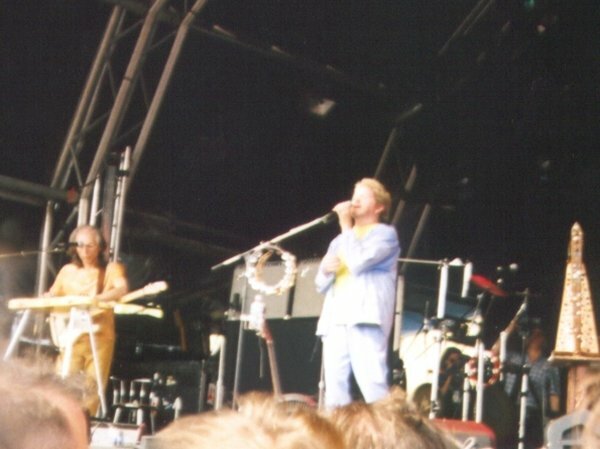 Yes at Glasto! 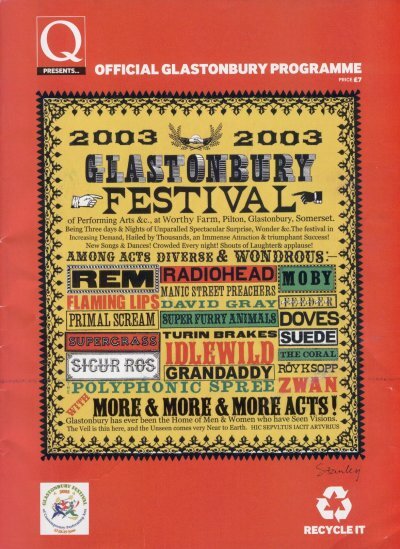 I've been going to this festival for over twenty years and seen some great performances by the likes of Bowie, Radiohead, REM, New Order, Lou Reed, The Cure, Massive Attack etc. etc., but Yes have never played there... until now. It'll be fantastic, this festival was made for them I can't wait..